I bought an Acer Aspire 4330 a few days ago, but I couldn't install Windows XP. I think it's designed for Vista, but I don't want to use it because it's unusable. Windows XP Setup coredumped after a minutes, and I thought I had to slipstream the installation CD to solve this. 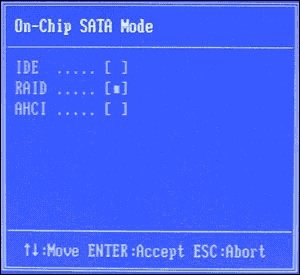 Fortunately, a friend told me that all I had to do was to change my SATA mode from AHCI to IDE. The setup then went smoothly. Installing the drivers is a PITA. The drivers in the provided DVD doesn't work because they're for Vista. I had to download the files from their FTP site. Unfortunately, they provide multiple drivers for the same device. Do I need to use the driver for Atheros? Or Broadcom? Or Intel? Blah. I'll continue installing the drivers tomorrow. I still have to finish this router/load balancer that I'm making. Hopefully, our connection would become twice as fast after we combine Bayantel and Globe connections. More on this later. I don't like PHP's new namespace separator. I prefer '::' to '\'. Aaaaargh... why did they choose the escape character? I've been wondering why lighttpd seems to be so slow when IPv6 is enabled. I discovered that I had to bump the minimum and maximum number of FastCGI process (min-procs/max-procs) by twice as much because it appears that lighttpd divides the available PHP processes between IPv4 and IPv6. I dunno why it does that. A DVD got stuck inside my MacBook. What I did was to insert a prepaid card (it's made of plastic that's thin yet durable enough for this purpose) into the DVD slot, pushed it upwards and pressed the eject button. The DVD then came out. I'm looking for a used Pentium III (or better) PC that I can use as a router/firewall. No need for monitor, keyboard, or CD-ROM. Just a CPU with enough hard disk and RAM. Please contact me if you have one. Cebu area only. One of my Unix workstation is now fucked up due to forced installation of incompatible libraries. I guess I'll have to reformat it in order to start from a clean slate. I'm planning to temporarily transfer my files to my external harddisk, but FreeBSD can't seem to read it although it has been formatted as UFS. I formatted that harddisk on my Mac OS X laptop, thinking that it can be read in FreeBSD, but Mac OS X seems to have a different interpretation of what UFS is. Blah. I guess I need to reformat my external harddisk to FAT32 too. Oh wait. If I format it as FAT32, what would happen with my file permissions? Maybe I'll just use tar or something. Blah, blah, blah.